The Cloud Security Alliance Cloud Controls Matrix (CCM) is specifically designed to provide fundamental security principles to guide cloud vendors and to assist prospective cloud customers in assessing the overall security risk of a cloud provider. The CSA CCM provides a controls framework that gives detailed understanding of security concepts and principles that are aligned to the Cloud Security Alliance guidance in 13 domains. 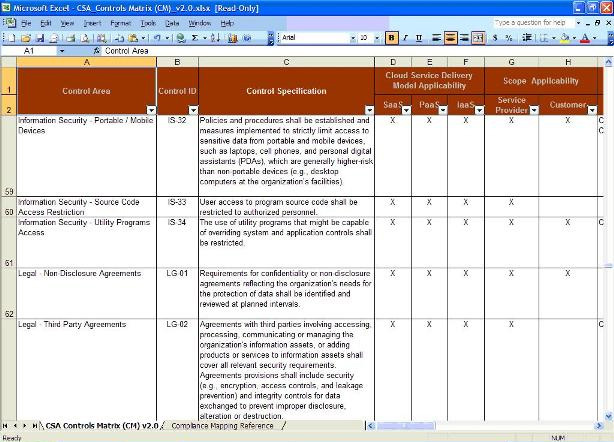 The foundations of the Cloud Security Alliance Controls Matrix rest on its customized relationship to other industry-accepted security standards, regulations, and controls frameworks such as the ISO 27001/27002, ISACA COBIT, PCI, and NIST, and will augment or provide internal control direction for SAS 70 attestations provided by cloud providers. As a framework, the CSA CCM provides organizations with the needed structure, detail and clarity relating to information security tailored to the cloud industry. The CSA CCM strengthens existing information security control environments by emphasizing business information security control requirements, reduces and identifies consistent security threats and vulnerabilities in the cloud, provides standardize security and operational risk management, and seeks to normalize security expectations, cloud taxonomy and terminology, and security measures implemented in the cloud. The Cloud Controls Matrix is part of the CSA GRC Stack. Becky Swain, CIPP/IT, CISSP, CISA – CCM Co-Founder/Chair, CSA Silicon Valley Chapter Board Member, Cisco Systems, Inc.
Laura Kuiper – Cisco Systems, Inc.
Kyle Lai, CISSP, CSSP, CISA, CIPP/G – KLC Consulting, Inc.
Pritam Bankar, CISA, CISM – Infosys Technologies Ltd.
Philip Richardson, CISSP, A.Inst.ISP, MBCS – Logicalis UK Ltd.
Anna Tang, CISSP, CIPP, CIPP/IT, Cisco Systems, Inc.